Writing not soon after participating in a Beijing Future of Finance by The Asian Banker — so plaudits and general are of the country momentum should be expected and discounted where needed. 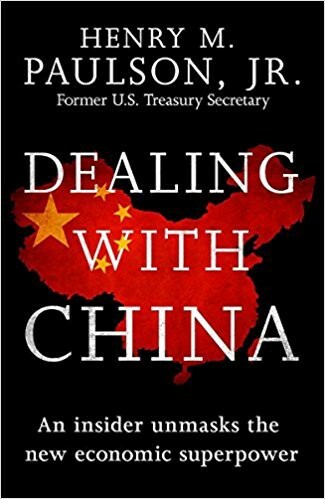 It took me less than an average Kindle-estimated time of 9 hours to devour Dealing with China, bought several years ago and relegated to a long and still growing backlog of worthwhile reads. Written by ex co-CEO of Goldman Sachs, ex U.S. Treasury Secretary Henry Paulson, it casts a personal relationship with a country that has been opening up to the outside world while being able to maintain its own course: tapping into global capital markets to reinvent old management systems (or the lack thereof), purge corruption and cronyism, and to connect the industrial potential of the Mainland China with ample capital financing. The story starts with Chinese goverment at the time of Jiang Zemin looking for external advice to shepherd through the structuring and the ensuing IPO of China Telecom and then PetroChina. I would be discussing with Zhu a matter that touched closely on both issues — restructuring China’s telecommunications system through an offering of shares in a newly formed Hong Kong–listed company. As part of its rapid modernization, China had been investing heavily in the area, keenly aware of how crucial state- of-the-art telecommunications were to a modern economy. by the end of the 1980s, there was still just one telephone line per 200 citizens (up from one per 500 in 1978). China embarked on a build-out unrivaled anywhere in the world, spending more than $35 billion on infrastructure between 1992 and 1996. The payoff was striking. Fixed-line subscribers leaped from 11.5 million to nearly 55 million; mobile subscribers soared from 177,000 to 7 million. From the end of 1996 to mid-1997 alone, 2.4 million more mobile subscribers would be added. But China still had a long way to go. In 1996 just 4.5 percent of the population had fixed-line access versus 64 percent in the U.S., while 0.6 percent had cellular access versus 16.3 percent in the States. This next passage reminded me of my personal experience being driven from the Beijing Airport — all cars suddenly changing lanes and not using turn signals seem to already have M2M telematics — as one can register little anxiety and emotion in general on the face of a driver. Beijing’s streets were filled with bicycles, and riding in the quickly growing fleet of automobiles was harrowing. I remember landing at the old airport and driving to our hotel on a single-lane road jammed with horses and carts, wobbly bicycles, and speeding cars. The driving was so aggressive—ill-advised passing, horns honking—I was relieved that we didn’t get killed, or kill someone. The $4.22 billion deal was constructed around the mobile telecommunications assets of two thriving Chinese coastal provinces, but because of the complex, scattered nature of the country’s telecom system, a marketable company had had to be built from scratch. … If China Telecom’s IPO failed, it could cripple the country’s move to a more open, market-oriented system. Unfortunately, the markets had turned ugly, and China Telecom was set to go public in the midst of the worst economic crisis to hit Asia in a generation. Goldman Sachs was leading the deal, and on the hook. The stakes could hardly have been higher. PLA officers also ran or abetted widespread smuggling operations that brought in cars, mobile phones, oil, cigarettes, and more. In 1998 President Jiang Zemin ordered the military to sell its commercial assets, increasing the PLA’s budget in return. The government cracked down on smuggling, and customs revenues jumped 81 percent in one year. I recalled what President Hu had replied when President Bush had asked what gave him nightmares: having to create 25 million new jobs each year. On the one hand, … some in the U.S. were criticizing China for wasting resources, damaging the environment, and contributing to global warming. On the other hand, many claimed the Chinese were hurting the U.S. by exporting too cheaply, and they were pushing China to rebalance its economy to encourage even more domestic consumption. How was China to pursue both increased consumption and sustainability? Six of the world’s 15 tallest buildings are in mainland China (the U.S. has three). Sixty-two of the tallest skyscrapers under way are being built there, including eight of the top ten. Paulson ends boldly: “If we want to benefit from an expanding global economy, we need the most dynamic growth engines, like China’s, to thrive.” It aslo pushes a new “soft-power” initiative with the Belt and Road Initiative, a 21st century Marshall Plan of China. To tell this story there is another good book: China’s Asian Dream: Empire Building along the New Silk Road. 10+ years, 2 labs, 1 bank, 2 startups, 1 exit. Digital banker, wishful tinkerer, amateur father. Fintech VC @gauss_vc and co-founder of @finfitapp.